Search results for: "The new champion of conspicuous consumption"
Mod Your iPhone for $2.5 Million. Really. First there was the Diamond Shuffle, at a mere $40K. Then there was Swiss manufacturer DEOS’s Diamond Earbud covers, which you could have for a paltry $4500. 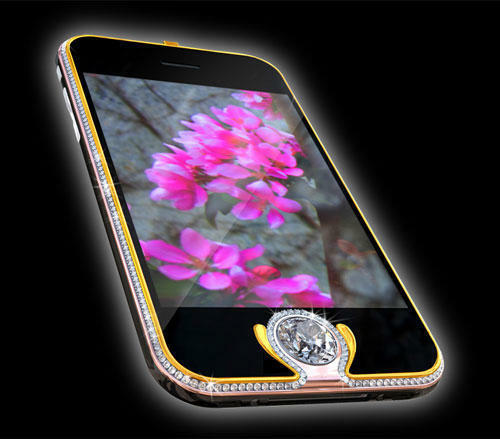 Comes now, however, the new champion of conspicuous consumption – iPhone division, the Kings Button iPhone mod, in which Austrian jeweler Peter Aloisson will encrust your device in three kinds of 18-carat gold (white, yellow and rose) and 6.6 carats of diamonds, for the “What Financial Crisis?” sum of $2.5 million. Kind of makes you wistful for I Am Rich, doesn’t it?